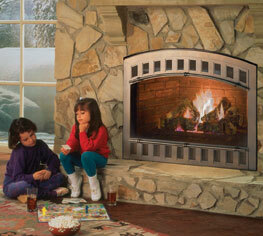 The Caliber nXt is a high-efficiency, full-featured fireplace is designed to complete homes with style. This beautiful fireplace now features a new, more-realistic log set with precise bark detailing, updated multi-dimensional refractory in herringbone or traditional brick, and a larger viewing area from which to enjoy it all. The IntelliFire™ Plus multi-function wall switch now comes standard with the Caliber nXt, giving you a more convenient, central location to control all aspects of the fire, from temperature to flame height to fan speed. Choose from six decorative fronts in black, brushed nickel or pewter finishes. Available in top or rear direct vent, up to 45,000 Btus, the Caliber nXt boasts an AFUE heater efficiency of 70% and a steady state efficiency of 75%. All components are UL safety certified and carry our Limited Lifetime Warranty.